Spreading the Craft Beer Gospel! 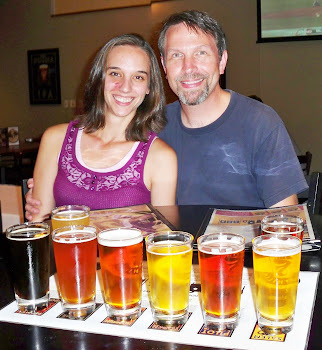 Bringing Craft Beer to the masses, one (or more) convert at a time! In clear, non-geek speak where taste is more important than style. Both Male and Female views of the beers. We're here to help you with that difficult question-should I drink this or that or what? Find us on Facebook, too! Links below! Last night, we had the pleasure of visiting a Georgia first...The Beer Growler--a shop that actually sells and refills growlers! Unfortunately, we missed most of the action as we arrived fairly late, but this gave us a great opportunity to meet the three owners-Denny Young, Paul Saunders and Sean Galvin. Immediately gracious and accommodating, they explained how the growler process works and how they managed to open the first growler bar in the state. We were given a quick tour of their cooler and not only do they have a phenomenal list of brews on tap right now---get ready Athens---more of some very special kegs are on backup! They also have an excellent selection of bottles and glassware, including our favorite, the Duvel tulip for sale. Due to expected issues with any opening involving draught lines, they opted for a soft opening but ended up being so busy, they didn't have time to actually finish the price tags for the beer bottles! Now, on to the point of all of this, the growlers themselves and what was available. The growler (aka the glass jug) is a one time purchase of $4 and then you pay to fill it up. After you finish your brew, bring back your old for a re-fill, they swap it out, and on you go. Not only does this insure you're getting some of the freshest beer to go (since you can't buy directly from a brewery in GA), but you're saving money by not having to pay for the brewery's packaging and shipping costs that normally get passed on to you. So we were able to pick up 64 ounces of Rogue's Old Crustacean Barleywine for $17 and 64 ounces of Terrapin's Monk's Revenge for $10! The other very cool bonus with growlers is you can take them with you on trips outside of GA where the breweries actually do growler fills. While we had a great time chatting with the owners and checking out the new shop, we were anxious to get home with our goodies and try our first GA growler from The Beer Growler. Do yourself a favor and head there tomorrow and get in line for some of the delicious choices! It's another episode of Cruisin' For A Brewsin'!